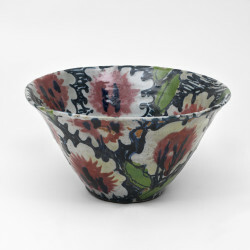 Oval-shaped stoneware dish, glazed and painted with abstract patterns and a fish, in pinks, greens, blues, and reds. Reduction-fired in gas kiln. Felspathic glaze with painted and slip-trailed glaze decoration. Oval Fish Dish, Janice Tchalenko and John Hinchcliffe, 1982, Crafts Council Collection: P307. Photo: Todd-White Art Photography.